President Trump just canceled 2019 federal pay raises. Here’s how much that could cost Greater Washington. At least, that’s the estimated economic impact from Trump’s cancellation of 2.1 percent federal pay increases that were to kick in on Jan. 1 for approximately 364,300 federal employees in the region, according to economist Stephen Fuller, and head of the Stephen S. Fuller Institute at theSchar School of Policy and Government at George Mason University. Trump spelled out his decision to use his authority to cancel the planned pay raises, along with planned locality pay increases, saying it would save billions of dollars at a time of tight budgets. “We must maintain efforts to put our Nation on a fiscally sustainable course, and Federal agency budgets cannot sustain such increases,” Trump said in a letter to Congress issued Thursday. Just four days earlier, he tweeted that the U.S. economy is “booming.” Congress has the ability to override Trump’s decision on the pay raise by passing its own increase, but Congress has not overridden a president on this matter in years. The decision immediately earned a strong rebuke from the region’s congressional delegation. The bad news for Greater Washington? That $882 million is a big chunk of change, especially for a federal workforce that has seen the loss of 4,600 jobs this year — which itself means a loss of $700 million in local wages. The good news? The pay raise cancellation is only a small portion of the projected 2019 gross regional product, which is expected to come in at $585.9 billion, according to Fuller, a substantial increase from the $528.9 billion that is expected this year. It puts only a small dent in overall growth — and it could have been worse. But the sudden loss of the pay raises shows the dangers in having a large chunk of the economy dependent on the federal government, which is affected by policy shifts and administration decrees that, at least in this case, come come without notice. 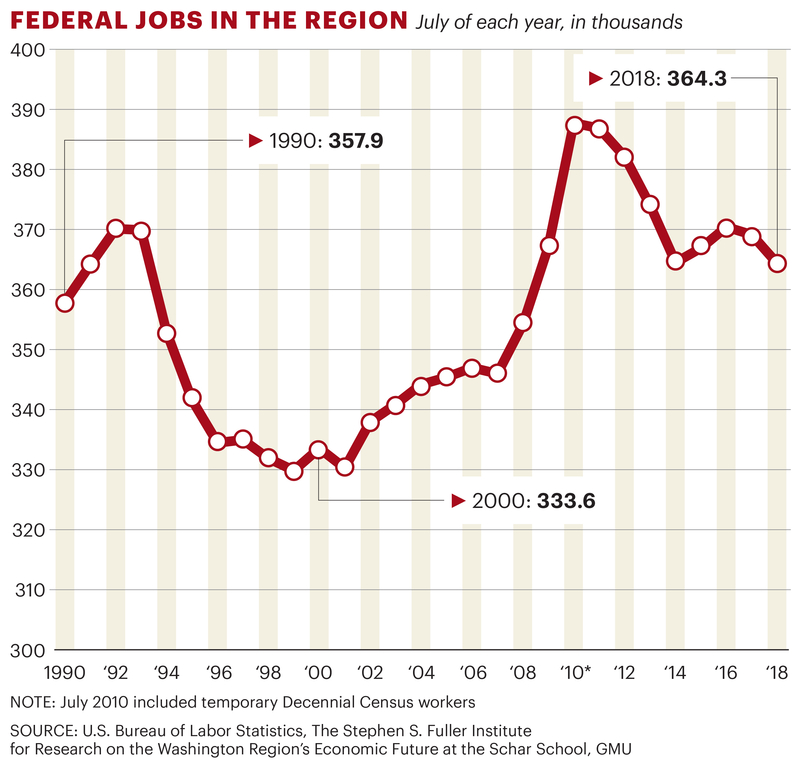 Overall federal spending makes up close to 30 percent of the regional economy, although federal wages and salary makes up only a small portion of that, with the lion’s share coming from agency contracting spending, according to previous studies by Fuller. “All the more reason to get Amazon to come to Washington,” Fuller said, highlighting the tech giant’s highly publicized search for a second headquarters and how it could help diversify the region away from federal spending.